power and grace to perform their sacred duties. To receive Holy Orders worthily it is be in the state of grace, to have the necessary knowledge and a divine call to this sacred office. One sacrament, celebrated three times with successively higher sacramental effects. Deacons are ordained to serve the community. Priests are ordained to lead the Church in worship. A monsignor is a priest who has special recognition as a member of the papal household. Bishops are ordained as the chief teachers of the Church. An archbishop is a bishop in charge of a large or important diocese called an archdiocese. A cardinal is a special member of the papal household. Nearly all cardinals are bishops, but there are one or two cardinals who are priests, such as Avery Cardinal Dulles, are priests. The pope is the Bishop of Rome. The sacrament of Holy Orders consecrates one in Christ for service to the Church. As the Second Vatican Council teaches, “Those among the faithful who have received Holy Orders are appointed to nourish the Church with the word and grace of God in the name of Christ.” (LG 11) Based on the example of Jesus who chose men as apostles to follow him and gave them authority to preach and heal in his name, the sacrament of Holy Orders is only conferred upon men. Three degrees constitutes Holy Orders in the Church: the episcopate, the presbyterate, and the diaconate (bishops, priests and deacons. By Baptism and Confirmation, all the faithful share in the common priesthood of all believers. 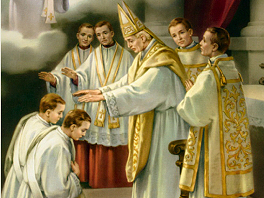 The priesthood of all believers is not the same as the special consecration received in the sacrament of Holy Orders. All the faithful share in the mission and worship of the Church. But the Second Vatican Council, relying on the ancient tradition of the Church, teaches that there is an essential difference between the priesthood of all believers and the ordained priesthood. Historically, even our forebears in faith, the people of Israel, who were set apart from all the nations by God, had from among their members, a particular group, the tribe of Levi, which exercised a priesthood. The function of the Levites prefigured the ordained priesthood of the New Covenant (CCC 1541). The fullness of Holy Orders received at episcopal consecration confers the threefold ministry of preaching and teaching, sanctifying and governing. Thus, the Catholic Church believes that bishops are constituted as true and authentic teachers of the faith. They are stewards of the mysteries of God. And they are to govern or lead by serving. The gospel images of Jesus which correspond to these ministries are teacher, priest and shepherd. Bishops are entrusted with the care of a local Church (diocese) but they exercise their threefold ministry collegially, with all the other bishops and in union with the head of the college of bishops, the Pope (CCC 1560). Priests are co-workers associated with the bishop, who hands on to them in a subordinate way his own ministry, so that Christ’s apostolic mission may be fulfilled (CCC 1562). Deacons assist bishops and priests in the celebration of the divine mysteries, in the distribution of Holy Communion, in blessing marriages, in the proclamation of the Gospel, in presiding over funerals and in the various ministries of charity (CCC 1570). Holy Orders configures one to Christ as teacher, priest and pastor. In the Latin Rite, all ordained ministers remain celibate for life, with the exception of permanent deacons. Celibacy is the sign that the ordained give themselves to God and the service of others (CCC 1579).